The U.S. Department of Commerce had hearings all day Thursday to hear from automakers, parts suppliers, ambassadors and others how they felt about the potential car tariffs the Trump administration wants to put into place, and they sure did hear a lot. 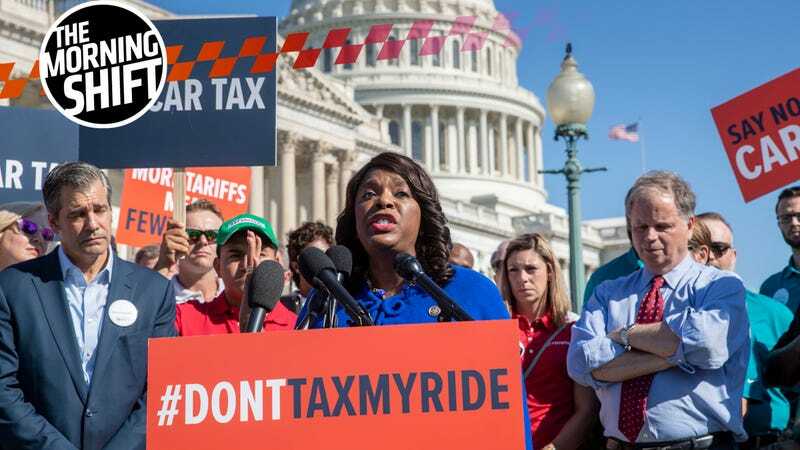 Corporations and representatives from foreign governments said the tariffs would hurt the U.S. economy and disrupt the global auto industry, Bloomberg reports, and auto groups and autoworkers also asked the administration not to impose the tariffs. The hearing happened as the Commerce Department is looking into whether vehicle imports threaten national security. Foreign governments such as Japan and South Korea noted that automakers headquartered in their nations have extensive U.S. operations, including manufacturing plants. “Japanese automakers have been playing a vital role in creating many jobs and supporting the growth of the U.S. manufacturing base,’ said Kazutoshi Aikawa, deputy chief of mission at the Japanese embassy. The strongest case for protecting the U.S. industry came from the United Auto Workers. Offshoring to low-wage countries including Mexico and China has hollowed out production in the U.S., and more autoworkers risk losing their jobs as the industry shifts to electric vehicles, said the union’s research director, Jennifer Kelly. She called for “targeted” actions to encourage investment in U.S. manufacturing. The business of vintage cars is a $160 billion industry employing dealers, auction houses, parts manufacturers, insurers, customs brokers, restoration shops and trucking companies. Mark Hyman, owner of St. Louis, Missouri-based dealer Hyman Ltd., warns that vehicle values would collapse if President Donald Trump were to implement 25 percent import tariffs. Hyman said that, at peak, 70 percent of his business is imported cars. He recently took delivery of a 1934 Bugatti Type 57 worth $1 million. With the additional levy Trump is said to be considering, import duties on the same vehicle would surge to $250,000, from $25,000. That’ll affect the amount of money prospective U.S. buyers will be willing to pay for cars located outside the country, he said. Small manufacturers facing competition from overseas companies also spoke against the tariffs, Bloomberg reports, saying they’re already impacted by steel and aluminum tariffs and that they risk losing more business with more tariffs. Any potential tariffs that come of this looming trade war are going to inevitably fall back on the consumer, but that wallet hit could on more than just the price of the car itself. Reuters reports that people in the industry said the tariffs could also raise the price of insurance, car parts, and even raise numbers of car thefts. Several insurance-company associations submitted a statement to the U.S. Commerce Department saying consumers will take on “virtually all the higher repair costs,” Reuters reports, and an association that represents 150,000 manufacturers, distributors and sellers of car parts and related items said a study it did found that the tariffs would increase the cost of vehicle ownership by $700 a year per household. A coalition of auto insurance groups said in previously unreported comments that hiking tariffs on imported auto parts by 25 percent could increase costs by 2.7 percent, or $3.4 billion annually, for personal auto insurance premiums. “Motor vehicle theft rates could well rise, as many stolen vehicles are sold for their parts,” the groups added. BMW and Volkswagen have gotten the go-ahead from the Chinese government last week to have the opportunity to take control of the local joint ventures the companies have invested in, Automotive News Europe reports. That’s major, for both the car companies and in terms of how China approaches joint ventures. China announced plans in May to phase out its rules about foreign ownership of manufacturing joint ventures in the country, which had a 50-percent cap for the foreign owners. [In July,] BMW and Brilliance Automotive Group Holdings agreed to expand annual production at their joint venture to 520,000 BMW brand vehicles in 2019. The joint venture, BMW Brilliance Automotive, is now equally held by BMW and Brilliance China. While BASF will become the first foreign chemical company to operate a wholly owned subsidiary in China, BMW will be first foreign automaker to own “more than 50 percent interest in its local joint venture,” the State Council’s website reported, quoting Li in Germany after the deals were signed. Like BMW, VW also signed deals with its Chinese partners in the presence of the Chinese premier and his German counterpart, committing to invest more in its China joint ventures. As part of the deal, Automotive News Europe reports BMW and Volkswagen agreed to invest more into their joint ventures in China. Reuters reports that Audi’s suspended CEO Rupert Stadler has appealed to a court for release from jail in Germany, which he landed himself in around June 18 thanks to all of that emissions cheating. Stadler initially cooperated with prosecutors but has now stopped giving statements, the prosecutor’s office said. Munich prosecutors are probing Stadler and another member of Audi’s top management for suspected fraud and false advertising tied to illegal pollution levels in its cars and manipulated vehicle tests. Audi named sales executive Abraham Schot as an interim replacement with immediate effect after Stadler was detained. Even if he gets out of jail, Stadler probably won’t return as Audi CEO. A June report from Automotive News said unnamed sources close to the Volkswagen Group’s supervisory board said the best solution for Staler will be to voluntarily step down once he’s out of prison, to save the company the drama of firing him. Look, it’s been a month. He’s learned his lesson. Jail! A CEO! The audacity of it all. The Dodge Journey and Grand Caravan will be around for the 2019 model year, but Dodge doesn’t want to talk about it further than that. Dodge is taking this one day at a time, alright, and the decision on whether modern buyers still crave a four-speed automatic transmission is a tough one. You’re lucky you don’t have to make it. Motor Trend had a Q&A session with FCA North America’s head of passenger car brands, Steve Beahm, recently, and there were talks about how the Hellcat and Demon have impacted the brand, a return of the Viper not being in FCA’s five-year plan, and other stuff. Beahm called the Durango’s SRT performance version “one impressive vehicle,” and said the Durango fits with what he wants to do in the future of Dodge. How do Journey, Caravan, and Durango still fit in Dodge? Or do they have a long-term role? They have a role through the ’19 model year. We don’t talk much beyond that. But being America’s performance brand, long term, [some of the vehicles] may not fit. “They have a role through the ’19 model year.” Ouch. Anything else? When does the Grand Caravan go away? We haven’t announced the end of production. It’s going to be through the 2019 model year, like the Journey, at this point. The world probably wouldn’t be worse off without new Journeys and Grand Caravans, if we’re honest here. On this day last year, Tesla and SpaceX CEO Elon Musk tweeted he had verbal government approval to build a hyperloop from New York City to Washington, DC. The official Musk was citing later said it wasn’t an “approval,” but hey, that was probably a better set of tweets than some of his recent ones. Neutral: Who Benefits If The Tariffs Are Imposed? That seems harder and harder to figure out.